Function: Helps In Reciprocating Piston Motion Into Rotation. We are a unique entity in this industry, actively committed towards offering a premium quality array of Industrial Crankshaft. Industrial crankshafts are made out of carbon steel, cast steel, S.G. iron materials through die forgings, open forgings, shell castings procedures. Crankshafts are case hardened, statically and dynamically balanced, fine ground finished to achieve the highest level of accuracy. Yanmar M200 & M220 Std size crankshaft. - Rebuilding worn out, undersize, seized main journal, crankpin to standard or required . - Size by Arconomic high velocity cryogenic (-)20ºC sintering followed by grinding and super finishing. - Runout / bend correction for free floating without applying any heat or pressure. Our company holds vast experience in this domain and is involved in offering Industrial Crankshaft. 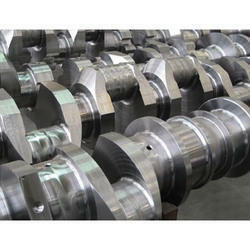 Catering to the requirements of our clients, we are offering Industrial Crankshaft.